There are all kinds of skills, qualities, and talents you need to be a successful project manager, but credibility is the single most important quality every project manager must possess. You certainly need to be able to see the big picture, be a leader, motivator, inspector and persuader; but, all of these qualities mean nothing unless you are seen to be credible. 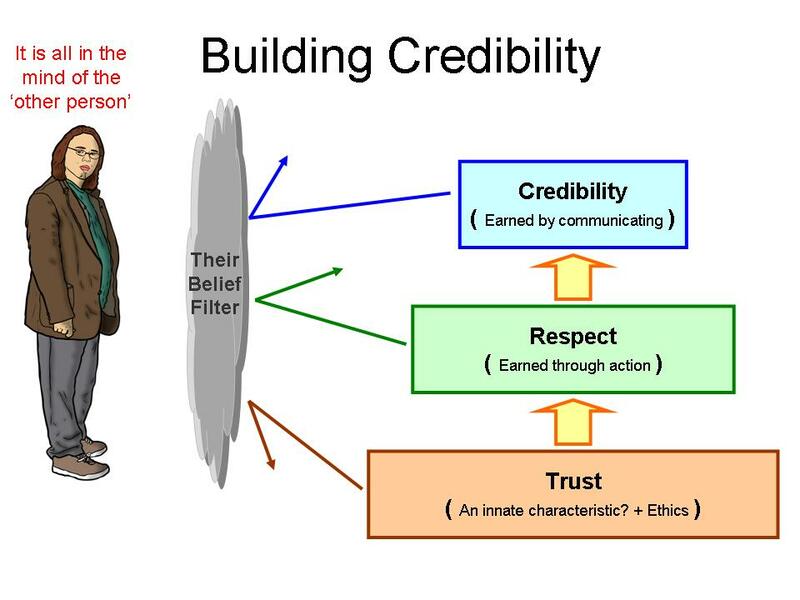 Credibility is a combination of being seen to be trustworthy, convincing, and reliable. It is built in the minds of other people who are ‘watching you’ or need to rely on you, particularly your team members, managers and other key stakeholders. People judge for themselves whether to take you at your word or not. Trust is the foundation – when someone trusts you, you can build respect through ethical and effective behaviour. Trust is simply the assumption that you will behave properly and do what you say you will do; most pet owners trust their pets to behave! You earn respect by demonstrating ethical and effective behaviours. But respect is not enough – you can respect gallant losers and enemies. The step from respect to credibility requires demonstrated competence, underpinned by knowledge (for more on competence see WP1056 Competency). When someone believes you are credible, that will listen to your advice and act upon your suggestions. However, the beliefs perceptions and assumptions have to be real in the mind of the ‘other person’! If your operating framework is not aligned with the other person’s belief framework you cannot be credible to them – it’s all in the mind of the other person. You may be the greatest IT project manager in the world, but if the way you dress and the jargon you speak does not fit with a particular senior executive’s beliefs about how competent mangers dress and speak, you will not be credible to that executive. The way to break through the ‘belief barrier’ is to build empathy. Empathy is the capacity to recognise the emotions that are being experienced by another – the ability to ‘stand in their shoes’. Within business this is more generally characterised by a combination of beliefs and desires, and grasping these beliefs and desires is essential to being able to develop empathy. The ability to imagine oneself as another person is a sophisticated imaginative process. An empathic interaction, however, involves you communicating an accurate recognition of the significance of another person’s ongoing intentional actions, associated emotional states, and personal characteristics in a manner that the other person can appreciate. It’s not the message itself that matters so much as the way it is communicated. 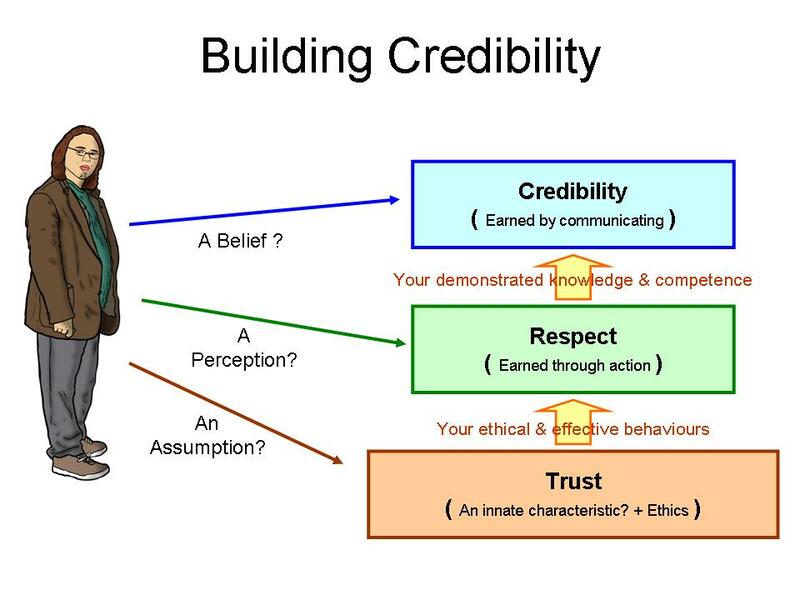 Put all of this together and you can build you credibility one stakeholder at a time. Do What You Say You Are Going to Do – Following through is easier said than done, and requires thoughtfulness to back up your words with actions…all the time. Your team is always watching how you behave. If you say you’re coming in early the next morning to knock out a tough part of the project plan, then make sure you show up early. Credibility starts with following through on your smallest commitments and migrates all the way up to your major promises. If you are not quite sure you can follow through; then don’t commit to it just yet. There’s nothing wrong with keeping your mouth shut and doing a bit more research before committing, and then following through on your promise. Don’t Talk Too Much – The more incessantly you talk, the less credibility you will have. Certainly, project managers need to talk, usually a lot. The key is to find the optimal point at which you become and stay credible by moderating how much you say and what you talk about. You can always add a bit more ‘talk’ if needed, it is impossible to unspeak something that is already said. Listen to Your Own Conversation – A very helpful practice is to listen to your own conversation and reflect on your dialogue with project team members. They’ll remember everything you say, so should you! By Accident – Certain things are out of your. You must rely on others to do what they say they are going to do. You can follow up, cajole, and persuade as much as possible, but ultimately it is the responsibility of the resource to get the job done. Your superiors will understand for a little while if you are unable to deliver on a project because of other people’s shortcomings. However, these little accidents will ultimately undermine your credibility if they continue to occur. 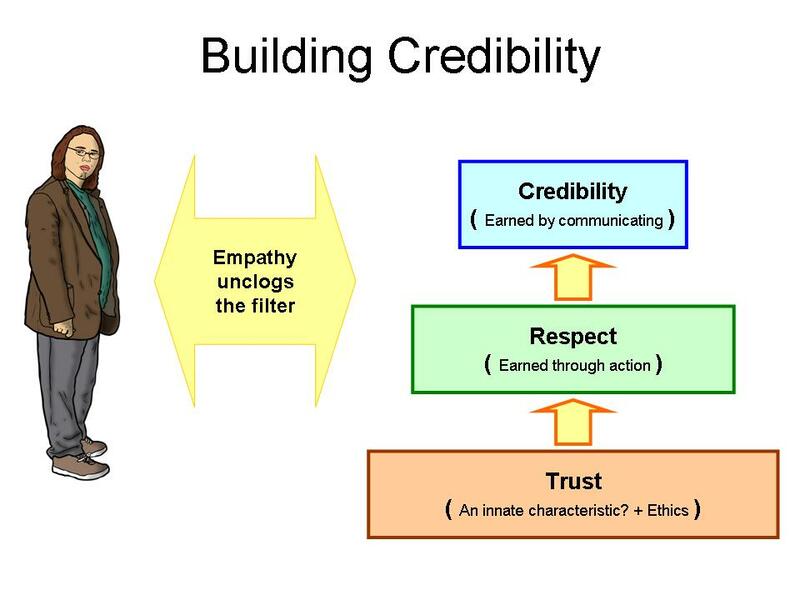 By Covering Up – You will destroy your credibility if you deliberately conceal information, it is a breach of trust – the foundation of credibility. By Being Manipulative – Another way to instantly lose credibility is to be manipulative. One technique of manipulation is convincing someone else that it’s in their best interest they get something done, when the reality is it’s in your best interest. Once the deception is uncovered your credibility is gone. Build a solid base of credibility and your project management career will flourish. Trust is the foundation (for more on trust see: WP 10030 The Value of Trust). From this base your actions and competency build credibility. It’s hard earned, invaluable for influencing managers and ‘advising upwards’ effectively to help your managers help you, and it is easily destroyed! The 2013 Project Governance and Controls Symposium held in Canberra last week was a great success – and planning for 2014 is underway, based on our first event, the Autumn Symposium in Canberra will become a highlight in the project controls and governance communities annual calendar! Now to move onto PMOZ – PM Global’s major spring conference. We have been working hard on a revamp to make the program more flexible, accessible and exciting and moved to a city centre venue. PMOZ 2013 will be held at the Grand Hyatt , Collins St., Melbourne from the 17th to 16th September (see more: http://www.pmoz.com.au/). 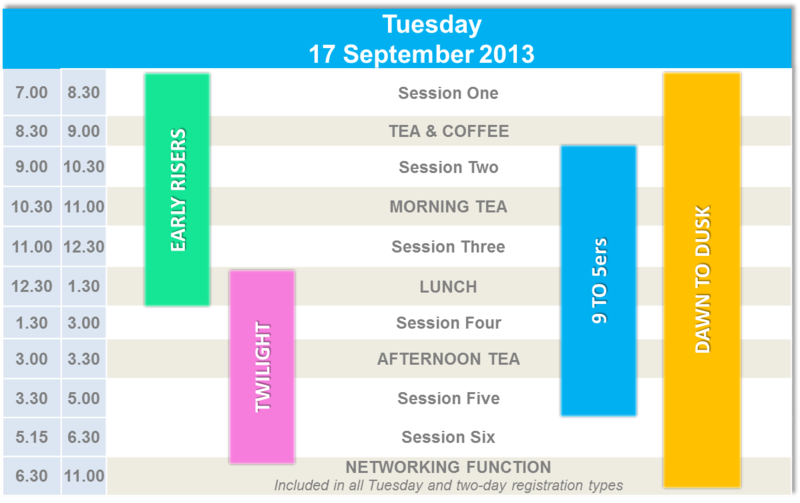 Early risers can attend an extended morning session on one or both days, and on Tuesday there is an extended twilight session. Positive dispute management – use facilitated options to avoid a costly fight. Project management in ‘Not for Profit’ and volunteer organisations with a focus on disaster recovery. Projects in organisations, focused on project governance, innovation, portfolio and program management, leading to the delivery of benefits and value. Planning and controls, focused on the tools and techniques required for effective project and program management. If the topic is a tool, technique or process used in project, program or portfolio management this stream is place to be!! People and the profession, focused on the people side of project and program management, all of the hard to use soft skills. As in previous years, a blend of academic and practitioner papers will be presented on a wide range of topics within each theme. The call for abstracts is being extended to allow time for potential presenters to adjust to this new structure – all papers and suggestions are welcome. Attending this new, dynamic and exciting event is altogether different – first you need to decide which registration option is best for you and then nearer to the day, which of the streams to attend during your time at the conference, there has always been a choice of excellent presentations – it has now become more challenging! Perhaps we need a workshop on decision making? Alternatively you can use our White Paper on Decision Making to help you choose. We have the PMBOK® Guide, the APM BoK and many other BoKs and standards ranging from ISO 21500 to the PMI Practice standards. We personally think they are useful and commit a significant amount of volunteer time to developing standards through PMI and ISO; as are certifications to demonstrate a person has a good understanding of the relevant BoK (and we make money out of running our training courses). However, we are fully aware that passing a knowledge based credential does not demonstrate competency (and that passing a competency based assessment does not demonstrate transferable knowledge – both are needed see: Developing Competency). For these reasons we commend the Association for Project Management (APM – UK, publisher of the APM BoK) for publishing a short video, based on a talk given by our friend and colleague, Dr. Jon Whitty to the APM in Reading UK in Nov last year. I hope it starts you thinking. Project Surveillance from an Expert!!! Last year at PMOZ 2012, I had the pleasure of listening to Lisa Wolf outlining the approach to project surveillance and health checks she has introduced and manages at one of the world’s foremost consultancy firms, Booz Allen Hamilton. Lisa’s presentation packed in more good advice than most people manage in a week! This year Lisa is back in Australia at the PMI Australia Conference, Sydney Convention and Exhibition Centre: 1 – 3rd May 2013. Her Master Class on the 3rd May is a must attend for any PMO manager, Project Director or Project controls professional. Lisa’s master class focuses on the approaches she has adopted and the lessons learned in setting up an internal project management surveillance function within Booz Allen Hamilton’s as well as her extensive experience assisting US Government agencies and other clients. The term surveillance is derived from the French word ‘surveiller’ and has a military pedigree. It refers to keeping watch on a location or person. In the case of project management, the notion of surveillance begs the question, “What do you watch?” Observing a project manager first hand is unnecessarily overbearing and may not be warranted. What you can watch is a project manager’s outputs from baseline establishment through project execution, as well as the people, processes, and tools in place to ensure appropriate monitoring and control processes are effective. During the workshop, Lisa will explore the ‘best practices’ that are essential for successfully establishing a helpful and supportive surveillance function, including the essential processes, procedures, and vital internal relationship-building will be explored. She has proved effective and helpful surveillance will improve project performance – you too can learn the secrets! For more information see: http://www.pmi.org.au/masterclass/. 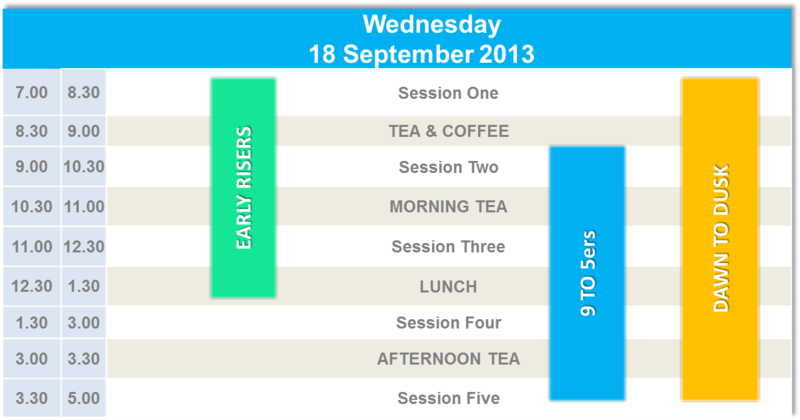 I’m certainly looking forward to catching up with Lisa in Sydney where I’m presenting our paper Communication ≠ Engagement on the 1st day. I encourage you to take advantage of this unique opportunity to learn from a ‘master’ and look forward to seeing you in Sydney. Canberra hosted the inaugural Governance and Controls Symposium this week – it was a relatively small event packed with highlights. The first PTMC (Project Time Management Certificate) workshop to be held in Australia – based on feedback from the attendees, this will grow to become a very popular training. A free networking evening looking at the future of ‘project controls’ in Australasia. During the meeting the final wind-up of the Australian Performance Management Association was completed. The main symposium included three outstanding key note addresses supported by stream papers and an engaging panel session. Gary Troop, the President of the newly independent College of Performance Management (CPM) and symposium key note speaker announced a limited time offer to anyone in Australia to join the for US$25. The CPM was a part of PMI from 1999 to 2012 but has reverted to an independent status to better serve the needs of the Earned Value community. The College has a major on-line library of EV publications and plans to develop its conferences and webinars on a global basis – there is even talk of establishing an Australian Chapter – to be part of the exciting new development visit www.mycpm.org/aus and become part of the worlds leading EV community. The project controls professionals present in Canberra expresses a strong desire to see a network established to link all of the various ‘controls focused’ components within professional associations such as AIPM and PMI, independent bodies such as CPM and Planning Planet and individual controls professionals to help raise the profile of project controls, amplify the message from any one component member, and through the network assist in career development and finding the ‘right person’ for work when needed. To help with this initiative, PM Global are starting to plan the second Symposium to be held in Canberra at around the same time in 2014 and discussions are underway to frame a proposal for a ‘no cost’ network designed to meet the needs of the ‘controls community’.